One of Co Donegal’s most famous hotels has been sold for an undisclosed sum. Harvey’s Point on the shores of Lough Eske has been bought by a fund managed by Davy Real Estate. The venue is a popular wedding reception choice for couples from Northern Ireland. It’s been sold after 30 years by Deirdre McGlone and Marc Gysling. Ms McGlone said: “This is a life-changing choice for us as a family. Marc and I want to spend more time with each other and with our three teenage children. Life is for living. 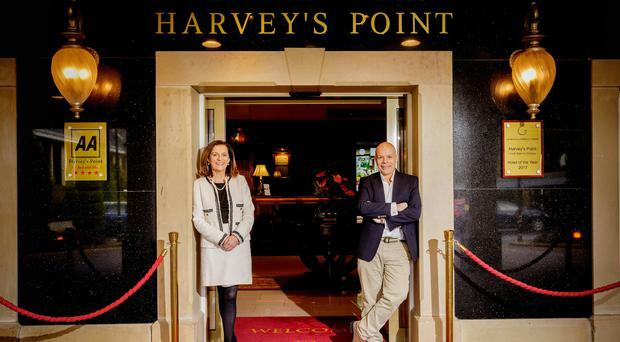 We have spent an immensely enjoyable 30 years at Harvey’s Point and it has been an amazing journey. This is a milestone year for the hotel and a year of celebrations are planned. The fund already has interests in hotels in Ireland. Tom Barrett of Savills managed the off-market sale of the hotel.